Children are a heritage from the Lord, offspring a reward from him.~ Ps. 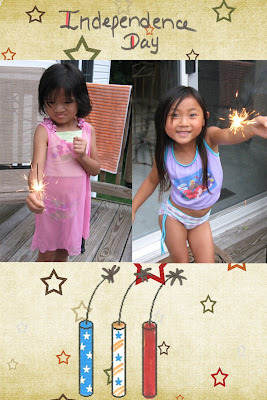 127:3: Happy 4th of July! 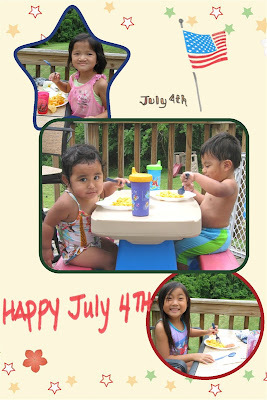 It's Independance week and we celebrated as almost every one does. A little outdoor fun and a BBQ. No matter where we live, we always find a way to be outside and to enjoy some good food. That is how American's love to celebrate, right? Play, play, play, eat, eat, eat. 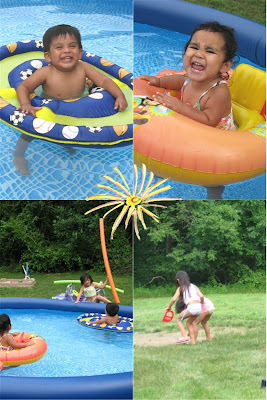 The Babies swam a bit while the Girls played in their "garden" (aka dirt pit). Then it was time for our hot dogs and hamburgers. We are thankful for our Independance this week and always. Our children come from a country where they would not have been free and where they could not mention God. So in our family we are all to familiar with what life would be like if ours were not free. Freedom has a price. That price was death. Our country is free because men died fighting for it. Good men. Men that founded this country on Christian principles. Our eternity has a price. That price was also death. Death on a cross by the Savior of the world. Don't stop fighting for your freedom and don't think it comes without death.